We helped some Chicagoans love their smiles again this week at The Loft! Our days were filled with cleanings, whitenings, porcelain restorations, Invisalign treatments and a beautiful veneer restoration on an absolutely beautiful patient. 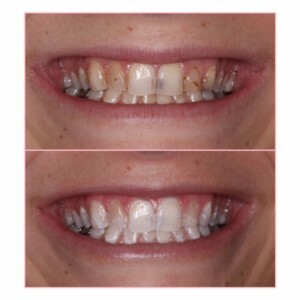 We started off the week on the right foot by treating another successful Invisalign with Zoom teeth whitening. Whitening your teeth is a great way to end any orthodontic case as it puts that “final touch” on already beautiful teeth with the added perk of giving the patient a little extra boost of confidence. Zoom is highly recommended for patients who haven’t had much history with whitening and are looking to achieve results of approximately 4-8 shades lighter. In the middle of the week, Dr. Jessica Emery (click on her name, it’ll send you to a fun article about her!) delivered a completion of a large cosmetic case. This was not just another cosmetic case, but truly one of Sugar Fix Dental Loft and one of Dr. Emery’s most special patients. We started seeing this particular patient about five months ago when she came to us for a comprehensive evaluation. Teeth with active decay were restored first and foremost. When that treatment was complete, it was onto the fun stuff. 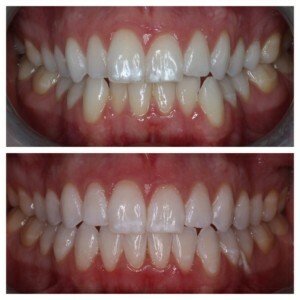 We performed our in-office Zoom whitening procedure on this patient with incredible results of 7 shades lighter! With the patient’s teeth at their optimal whiteness, we were then able to restore her teeth using enhanced cosmetics with porcelain veneers. The end result was nothing short of perfection. Dr. Jessica Emery and her team were given such a beautiful patient on the inside and out and we’re happy to add the finishing touches to make this patient feel 100% confident about her smile and overall condition of her teeth. We love our “jobs” for this very reason – it’s all about our patients. Please stay tuned to our future blogs to see this patient’s final cosmetic work and treatment…it’ll well be worth the wait, we promise! The potential is amazing with porcelain veneers. If you ever considered veneers for your smile, reach out to Dr. Emery. It is her true passion and she would be happy to offer a consultation to discuss your specific potential. Also, be sure to follow Sugar Fix Dental Loft’s Facebook page on Monday…we’re having a UNIQUE photo shoot! !